Russian nationalist Potkin sentenced to 7.5 years for organizing extremist movement | Russian Legal Information Agency (RAPSI). MOSCOW, August 24 (RAPSI, Lyudmila Klenko) – Moscow’s Meshchansky District Court has sentenced Russian nationalist Alexander Potkin to 7.5 years in penal colony for organizing an extremist movement and embezzling funds from the Kazakh BTA Bank, RAPSI reported from the courtoom on Wednesday. The court has also fined Potkin 600,000 rubles ($9,400) and ordered him to pay 4.9 billion rubles ($76.5 mln) to suffering party of the embezzlement. A prosecutor earlier asked the court to sentence Potkin, who is also known as Alexander Belov, to nine years in penal colony. Investigators claim that Mukhtar Ablyazov, former chairman of the bank, who wanted to destabilize the constitutional order in Kazakhstan, asked Potkin to help him with organizing an extremist group. Potkin allegedly agreed and used funds embezzled from BTA Bank to spread the nationalist ideology in Kazakhstan. Potkin was arrested on October 15, 2014 at the Hotel Intourist Kolomenskoe in Moscow on charges related to the embezzlement of $5 billion from BTA Bank. 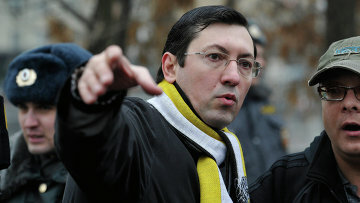 At the time of the arrest, Potkin allegedly had documents on him that effectively tied him to the embezzlement. Investigators believe that Potkin (Belov) was a mastermind in a money laundering operation in 2012-2014. He was also suspected of involvement in laundering money that was embezzled from BTA Bank by its former chairman Mukhtar Ablyazov. Ablyazov, who allegedly defrauded BTA Bank of more than $6 billion, left Kazakhstan for the UK, where he was granted political asylum in 2011. However, he remained a fugitive from justice since February 2012. Ablyazov’s whereabouts remained unknown until he was detained on July 31, 2015 near Cannes, France. Kazakhstan, Russia, and Ukraine are all seeking his extradition. In October 2015, French authorities approved Ablyazov’s extradition to Russia. 15:41 24/08/2016 Moscow’s Meshchansky District Court has sentenced Russian nationalist Alexander Potkin to 7.5 years in penal colony for organizing an extremist movement and embezzling funds from the Kazakh BTA Bank.